Place the butter into a 10-inch heavy bottom ovenproof frying pan or cast iron skillet and heat in the oven until butter is melted. NOTE- Heating the butter in the skillet until it's hot and melted before adding the batter, guarantees a desirable CRISPNESS on the outer edges of the bread. While the pan is heating and the butter is melting, prepare your cornbread batter. In a large mixing bowl, stir together the cornmeal, flour, sugar, baking powder, salt, buttermilk and egg until well blended- wire whisk if possible. Pour batter into the HOT and buttery skillet (batter will sizzle), return to the oven and bake for 20 - 25 minutes until bread is golden brown and a toothpick or cake tester inserted into the center will come out clean. Remove from oven and let cool on a wire rack for approximately 5 minutes. Invert cornbread onto a large plate and cut into wedges. Makes 6 - 8 cornbread wedges. Quick, easy, & delicious! My family raved and devoured it! Thank you for sharing! What do you do with the 1/4 cup of vegetable oil? It is listed in ingredients but not instructions. This is the best cornbread I have ever had. I will be making this for my family forever. Wonderful recipe, I have made this too many times to count! One thing I did want to add is that the ingredient list calls for 1/4 cup of vegetable oil, yet this is not included in the list of things added to the mixing bowl. Assuming this is just an oversight, I have continued to add the oil to the mix every time. 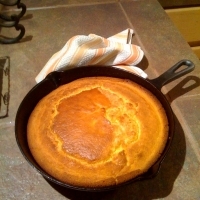 The end result is a fantastic cornbread with a crisp, buttery flavored crust. Absolutely delicious! Just finished the bread --great crumby texture --went well with soup ,then I fried some bacon and egg and we had more of the bread with home made tomato sauce /ketchup --delish .Thanks for this one . I have just scribbled this down and am going to make it to have with our Saturday lunch soup in an hours time. .Sounds delish and easy --my 5 already !! Great recipe!! And works for seasoning new cast iron!! ANOTHER GREAT RECIPE!YOU ALWAYS COME UP WITH A WINNER!!! 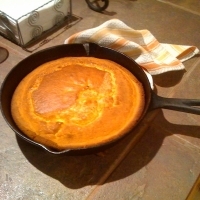 Ya gotta love the crustiness of cornbread in cast iron. I wouldn't make it any other way! Thanks, new and you got my 5. Like thenewagecook's recipes? Never miss an upload!